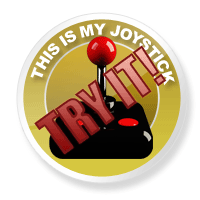 iBomber Defense: Pacific Review - This Is My Joystick! Unless you’ve been living under a rock for the last decade or so, the words ‘tower’ and ‘defence’ in the same sentence will cause you to either get excited or sigh with boredom depending on your stance. The concept of having to place turrets and blockades to stop waves of plodding enemies from destroying your base was popularised years ago by Flash titles like Desktop Tower Defense, and since then has been butchered and reinvented more times than the Lib Dem manifesto. Not exactly a history lesson of the future. iBomber has a plot like every Steven Seagal movie since Under Siege; it’s there, just barely, and serves only to string the locations together and provide some context to the slaughter. This is nothing new and I’m sure we’re all used to action games being written on the backs of napkins in expensive Hollywood bars. What plot there is follows first the Allied forces and then the Axis, through missions that attempt historical accuracy in their little briefings but give up entirely in execution. Again this isn’t much of an issue and it’s actually nice to be given some context; many TD games consist of: “Here base. Bad guys will come. Use turrets and such”, giving players little to no actual reason to progress. In this respect iBomber should be praised. I’m going to admit I didn’t finish the game. The repetitive missions quickly descend into tedium after the initial barrage of new stuff ceases and the flimsy briefings stop being enough to warrant another level of placing turrets and hoping they don’t explode. If you’re a fan of the core TD mechanic however, this could be just what you’re looking for. I’m not going to explain the basics of the genre; Wikipedia does that well enough. What iBomber does differently is in its direct interaction and progressive upgrade system. The game tracks your profile throughout and allows you to unlock and use perks that improve your chances of success. Each level is laid out as you would expect, and marked-out squares show you where you can place your myriad of defences. Starting with basic machine gun turrets and progressing quickly, all the WW2 staples are represented here and each has its own purpose. Turrets cut down troops, cannons annihilate tanks and boats, and flamethrowers eat at armour to allow the basic guns to do their job easily. Unique to iBomber are the Comms Tower and the Bomb. The former can be built next to existing defences to increase their range and effectiveness, whereas the latter is a spinning box that must be protected. A little blue bar fills up over time and grants a bomb every time it hits the top. This bomb can then be dropped on enemy bases, units or even placed defences. It allows some semblance of personal interaction with the combat and gets you out of many a tight situation. Each defence type can be upgraded on and off the battlefield. Every successful mission grants Victory Points which can be used to permanently improve your placements, increasing their armour, range and speed as well as allowing a specialisation once you reach the top level. These upgrade quickly at first but become harder to achieve as the game progresses, so choosing your improvements wisely is a must. These upgrades don’t automatically work though, and only provide the opportunity to improve your emplacements on the field. This costs money and presents the first frustration of the game. Everything costs money; new emplacements, upgrades, repairs and special actions. The issue is that money is always tight and you never seem to have quite enough, because you’re paid so poorly for each enemy unit killed. 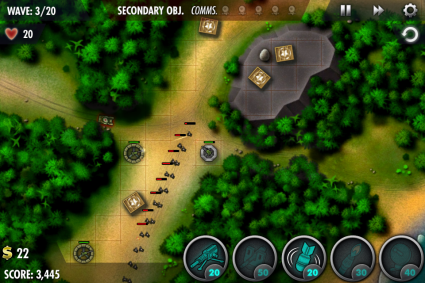 Troops will swarm you and you’ll need to build multiple turrets to thin them out, but tanks and vehicles will start rolling in before you’ve earned enough cash to compensate for them. You’ll go through one or two gruelling waves watching your puny turrets desperately pound the tanks with mostly ineffective bullets, hoping and praying you destroy them; if only to earn the cash to build cannons to beat them and crawl back some piece of mind. Some may see this tension as a good thing, but it’s a problem that isn’t limited to the first few levels. You consistently feel like you’re one step behind. You’re given no indication of the contents of the next wave and even if you were, chances are you’d be too skint to do anything about it. Enemy units regularly sit just out of range, forcing you to drop a bomb on 2 soldiers or save up for 5 rounds so you can make that one turret ‘dig in’ and fire that little bit further. It’s tedious and tiring at best and utterly miserable at worst. Of course, if you’re a big TD fan this will all be perfectly normal for you and you’ll have likely developed ways of dealing with it long ago. The unique features will spice up a solid and easily-controlled game of classic TD and the short missions will be perfect for bus journeys or waiting rooms. For those looking for a stripped down experience there’s two Bonus Stages; massive battles with 40 and 50 waves respectively to really test your mettle. Unfortunately the game falters technically as well. It takes an age to load everything, on par with some console games, and its Crystal support seems to be broken, denying score-conscious players from bragging to their mates over Chillingo’s networking platform. It regularly crashes at menu screens, and audio and visual glitches are irritatingly regular. iBomber does well to look tasty on my iPod Touch’s little screen. Everything is hand drawn from the environments to the enemy units, and it all works well together. Explosions and gunfire look lovely and cartoony, recalling the Metal Slug and Gunstar Heroes series to name but two. With everything being so tiny on-screen it’s difficult to admire the detail on offer without a magnifying glass, but nothing looks fuzzy or distorted. Except maybe the solders, who adopt the standard shape of the cheap RTS; hats with guns. I think the issue is that WW2 has been done so many times and was generally pretty samey in terms of design and colour unless you’re a war-gear nut. iBomber does well with its resources though and could never be called ugly. As is to be expected, iBomber sounds decent but not amazing coming out of the tiny speaker on my iPod. Stick in headphones, however, and it’s a whole different story. It has the audio production of a larger, more expensive title. Epic period music sweeps across battles and menus alike, creating a WW2 atmosphere we’re all familiar with. Combat explodes with rattling gunfire and earth-shaking explosions, really bringing the action to life. 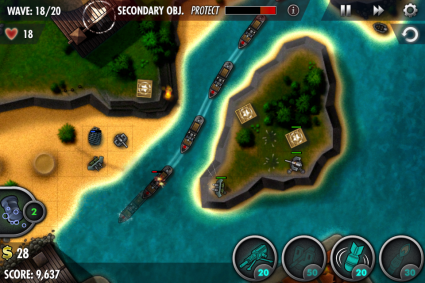 iBomber Defense: Pacific is either another failed attempt to elevate TD above the standard drudgery or a brilliant example of the genre with some unique and interesting twists. It all depends on your perception. So I’m going to give it two conclusions to serve both sides. For newcomers or non-fans of the TD genre, iBomber fails to do anything new enough to improve the core mechanic that turns us off the style altogether. Levels still consist of hoping you put the right things in the right places and being able to do very little about it if you didn’t. The new features serve to soften the blow somewhat, but not usually enough to allow iBomber to approach something resembling enjoyment after the first few missions. Levels become tedious slogs to the end for no reason, the story being almost non-existent as it is. This won’t make you a TD fan overnight; however, it may just be enough to pique your interest in the genre. For lovers of the TD revolution, on the other hand, iBomber is a supreme example of how to take a tried-and-tested genre and switch it up with new features and ways to play. The core gameplay appeals to all the classic features of the style and fits well within the setting. The experience is consistent throughout and offers different enemy arrangements and attack directions to tease your brain and test your tactical prowess. While it may not be a revelation, it’s certainly a great mobile addition to a much-loved style of gaming that shows no sign of going away. So there it is; make up your mind based on your love or loathing of the genre base. It’s a tricky one to score but luckily our system is flexible and based on the context of the review, so give iBomber a shot and see if it does it for you. iBomber is available exclusively on iDevices for a slender £1.99, and a Lite version is available for free so you can give it a shot.